Remember last Thursday night when I got home late and Nick had dinner waiting for me? Well, sometimes when I don’t get home til late, he likes to cook dinner for me. And sometimes when I get home late, he gets bored and goes out in search of wings and beer with the boys. Like last night. During the holiday season, I get a little obsessed with pumpkin. For the rest of the year, the obsession subsides slightly, but it’s still there. 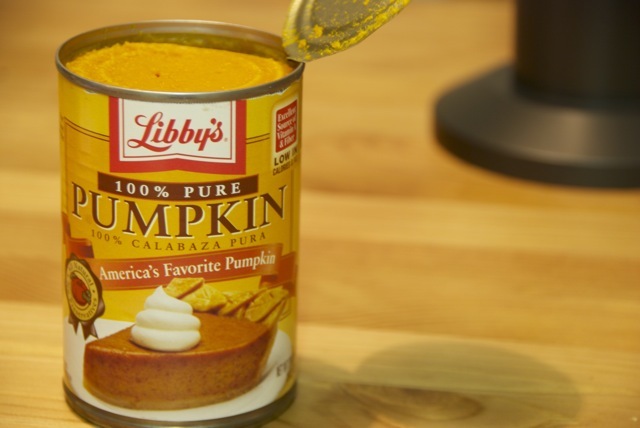 Last year, there was a pumpkin shortage because of too much rainfall, and I couldn’t find any cans of pumpkin all spring or summer. In fact, I didn’t locate a single can until about a week before Thanksgiving when Publix finally got in a limited quantity but posted a sign “Limit 2 per person.” WHAT!? I couldn’t risk having this happen again this year, so as soon as an abundance of pumpkin hit the shelves of Wally World, I stocked up. 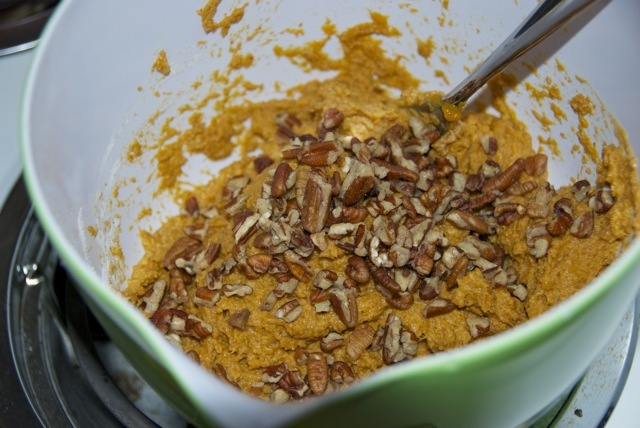 For weeks over the holidays I was making pumpkin pancakes, pumpkin oatmeal, pumpkin yogurt, pumpkin black bean burgers, pumpkin pie smoothies… if it had pumpkin in it, I was making it. It’s been a few weeks since I’ve broken out the pumpkin (trust me, that’s a long time), so I decided it was time. 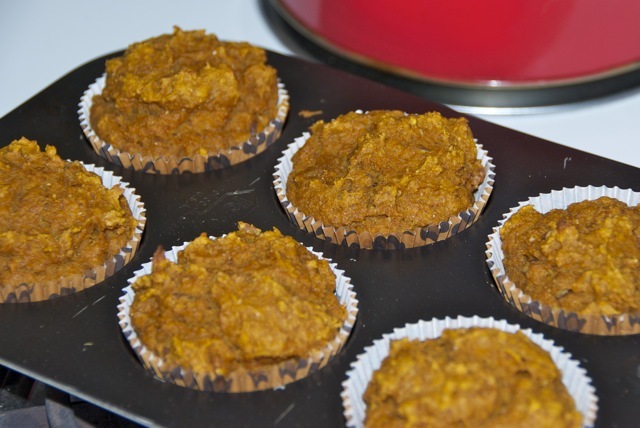 I decided to make my favorite pumpkin muffins! 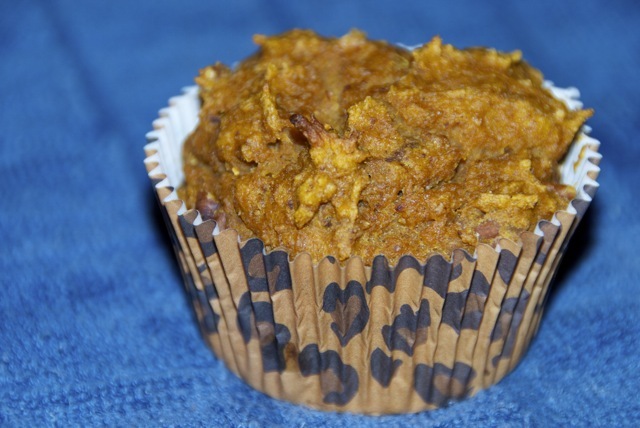 Now, these aren’t your typical 600 calorie greasy sugar crusted pumpkin muffins. If you’re looking for dessert, don’t make these. 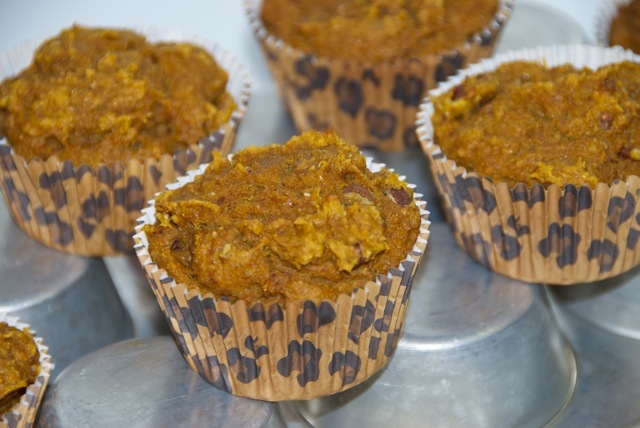 But if you want an awesome healthy everyday breakfast pumpkin muffin, get your oven mitts on! This is a recipe that’s pretty much all my own. 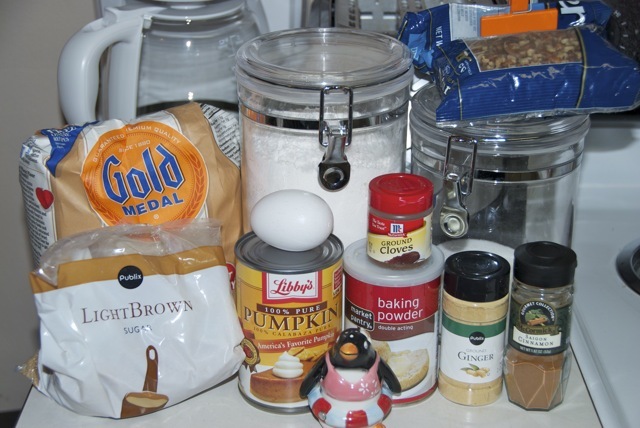 It started as two recipes: a full blown oil and sugar bomb recipe and a bare bones Splenda and egg substitute recipe. I combined the two for a happy balance of healthy. It’s not full of fat and it’s not full of chemicals. I’ve made it a zillions times, and finally have tweaked it to perfection (in my opinion). I only made a half batch last night, but I’ll post the full recipe here. As always, assemble your ingredients. Preheat oven to 350 degrees. 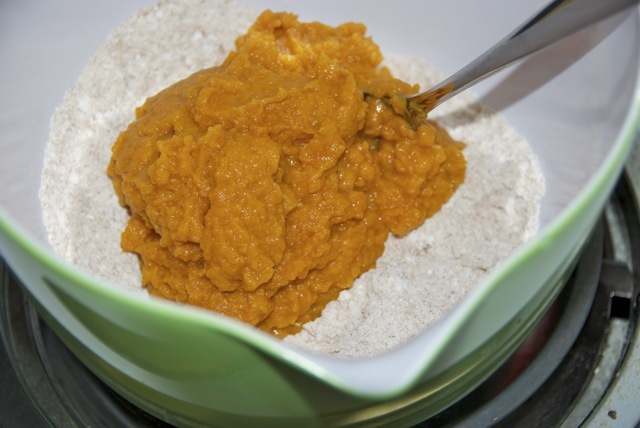 In a mixing bowl, combine flours, sugars, baking powder, spices and salt. 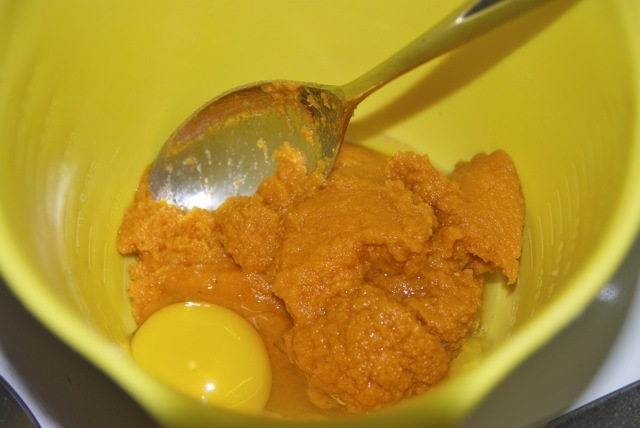 In another bowl, combine pumpkin, eggs and vanilla extract. 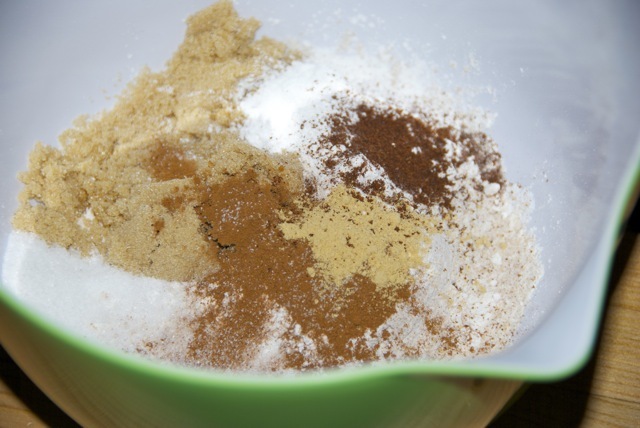 Add the wet ingredients into the dry ingredient and mix well. Then fold in the pecans. You could also use sunflower or pumpkins seeds, raisins, craisins… as I was cleaning up I saw some crystallized ginger in the cabinet and though that would have been a tasty addition too! 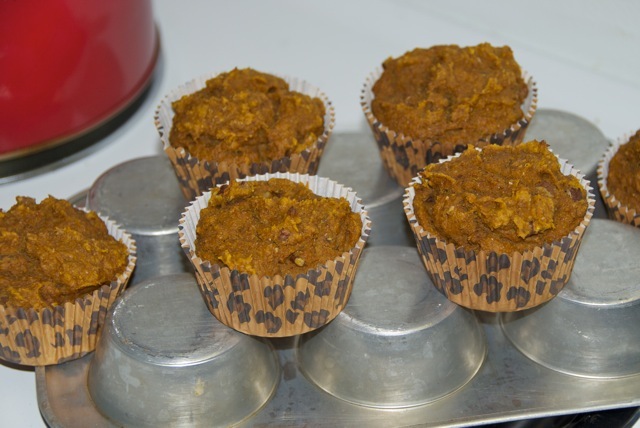 Fill muffin tins with 12 even scoops. You can use cupcake liners, but you don’t have to. This is actually the first time I’ve used them. 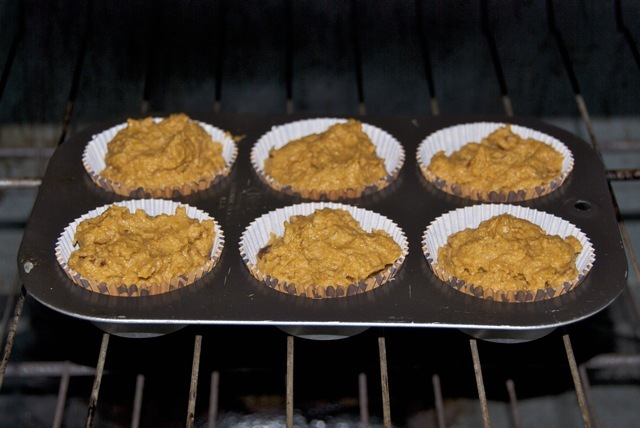 Just make sure to spray the muffin tin with nonstick spray if you aren’t going to use the liners. Bake 20-23 min, or until a toothpick comes out clean. The muffins are on the smaller side, so two for breakfast is just perfect. I suggest smearing them with a little butter or whipped cream cheese. I don’t care if it’s not Thanksgiving, these babies are good all year long. Long live pumpkin!! Om nom. I love pumpkin too. I got a trader joe’s pumpkin pancake mix last fall that was amazing. I wish I’d bought four boxes while they were in stock. 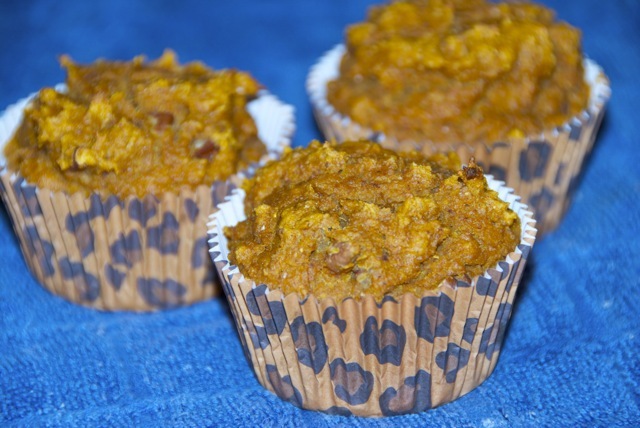 These muffins look awesome, I’m adding them to my ‘to make’ list.